In an analysis prepared for three California state agencies, the Pacific Institute estimates that 480,000 people; a wide range of critical infrastructure; vast areas of wetlands and other natural ecosystems; and nearly $100 billion in property along the California coast are at increased risk from flooding from a 1.4-meter sea-level rise – if no adaptation actions are taken. 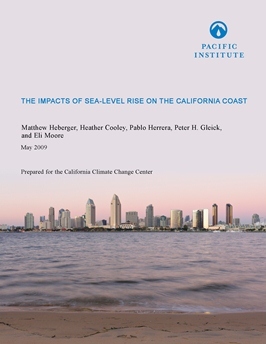 The Pacific Institute report, The Impacts of Sea-Level Rise on the California Coast, concludes that sea-level rise will inevitably change the character of the California coast, and that adaptation strategies must be evaluated, tested, and implemented if the risks identified in the report are to be reduced or avoided. Populations and critical infrastructure at risk are shown in detailed maps prepared by the Pacific Institute available online here. The report also explores how vulnerability to sea-level rise will be heightened among Californians who do not have a vehicle, do not speak English, or who live near hazardous waste facilities. Low-income households and communities of color are over-represented in these more vulnerable groups. Funded by the California Energy Commission, California Department of Transportation, and the Ocean Protection Council, the report was authored by the Pacific Institute’s Matthew Heberger, Heather Cooley, Pablo Herrera, Peter H. Gleick, and Eli Moore. Google Map Interactive online map showing the coastal flood and erosion hazard zones from our study. You can also display the location and attributes of health-care facilities, schools, fire and police stations, wastewater plants, and EPA-listed facilities that are vulnerable to coastal flooding. Hazard Maps Downloadable PDF maps showing the coastal flood and erosion hazard zones from our study. Data are overlayed on aerial photographs and show major roads. These maps use the quadrangle names and boundaries as US Geological Survey 7.5-minute topographic maps. The maps are 1:24,000 scale when printed at full size, 17”x 22”. Thematic Maps Downloadable PDF maps from our study that allow you to visualize the impacts of sea level rise on the California Coast. Key impacts featured here include population and property at risk, miles of vulnerable roads and railroads, vulnerable power plants and wastewater treatment plants, and wetland migration potential.This information is being made available for informational purposes only. Users of this information agree by their use to hold blameless the State of California, and its respective officers, employees, agents, contractors, and subcontractors for any liability associated with its use in any form. This work shall not be used to assess actual coastal hazards, insurance requirements, or property values and specifically shall not be used in lieu of Flood Insurance Studies and Flood Insurance Rate Maps issued by the Federal Emergency Management Agency (FEMA). The Pacific Institute can carry out sea-level-rise analysis for other shoreline communities. For information, contact Nancy Ross at nross (at) pacinst.org, 510-251-1600 x106.